Magical things happen when contemporary designs find their way into the hand of our Amish master craftsmen. 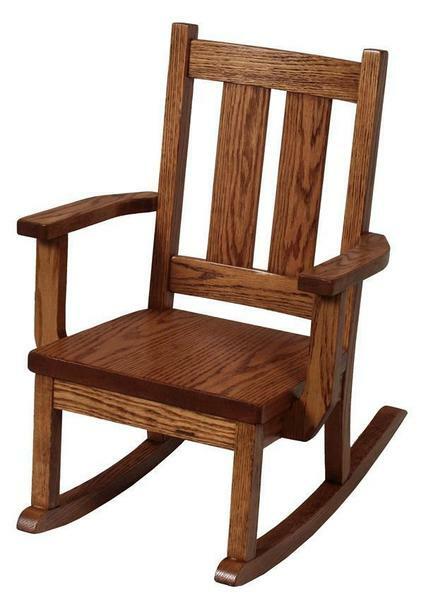 The Aspen Delta Kids' Rocking Chair is a prime example of this exceptional beauty, with its early-century lines forming into a distinctively blocky frame that artfully brings together the best parts of the Mission and Shaker schools of design. All of this beauty is founded on a solid wood build that features exceptional joinery, hand-sanded surfaces, and perfectly-angled rockers that promise decade after decade of enjoyment and relaxation for as many kids, grandkids, and great-grandkids as need it. Your Aspen Delta will be built to order in your choice of wood and then finished with your choice of stain. The woodshop that crafts these pieces is ideally placed to add in custom features, so please don't hesitate to get in touch with us by phone or by email at any time if you'd like to talk about having our woodworkers craft a completely custom Aspen Delta that perfectly fits your needs. We love the Aspen's beautiful transitional look, and we would love to talk with you about the delightful warmth and grace it brings to the family home. 19" x 23" x 26"